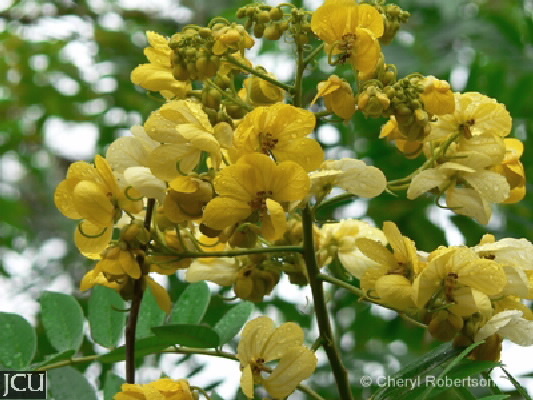 Formerly known as Cassia spectabilis, this tree to 6 m with a spreading canopy and pinnate leaflets is originally from central America. The yellow flowers are held in dense racemes above the foliage. The cylindrical brown pods are to 30 cm long. Flowering summer. Cassia siamea from India has a similar appearance to this species but the inflorescence is not held erect and is not as dense, it is becoming a weed in parts of Australia.